What a wonderful story with a great ending! Hey, my name is Cory. That is some story. I would absolutley love to hear more about what you and Mr. King talked about. BB is one of my all time influences. We talked about how happy he was to get his birthday guitar back. How he played at Bo Diddley’s funeral. How proud he is of the Lucille’s that Gibson makes and he hoped that I would enjoy the one he gave. 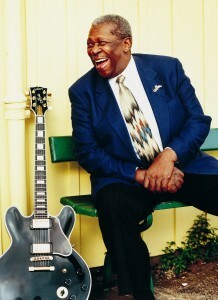 Just a very nice genuine man who also happens to be the King of the Blues. It still doesn’t seem real to be honest. Thanks for responding Eric, It’s a great heart-warming story! This is one of those instances where humanity and integrity transforms the often small minded pursuit of collecting into the truly transcendent. Thank you for your contribution to the archetypal compendium of collective good character. I’d just like to know how many people would be so honest to make such a long research behind the hidden story about an apparently “fake” guitar…I’m so glad that you was able to give it such a happy ending, and, of course, that Mr. King received back his beloved guitar…, but, undoubtably, the hero is you, Mr Dahl. Thanks for don’t stop believing in honesty.